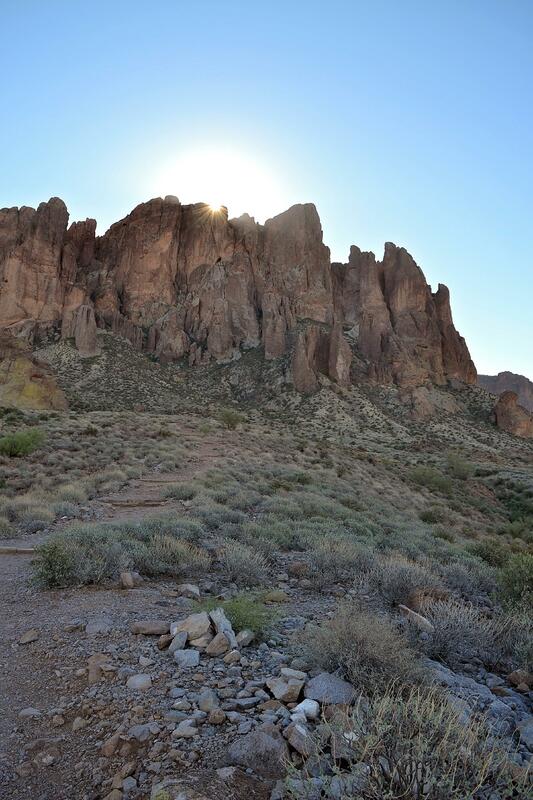 Standing in a parking lot at the ominously named Lost Dutchman State Park, I'm far from winter's reach. But will Arizona's heat dry my running nose? I stuff a litre of water into my backpack and think what a cruel irony it is to suffer a cold in the desert. Before hitting the trail my husband and I take the necessary precautions to practice safe sun, spraying our fair complexions with sunscreen. 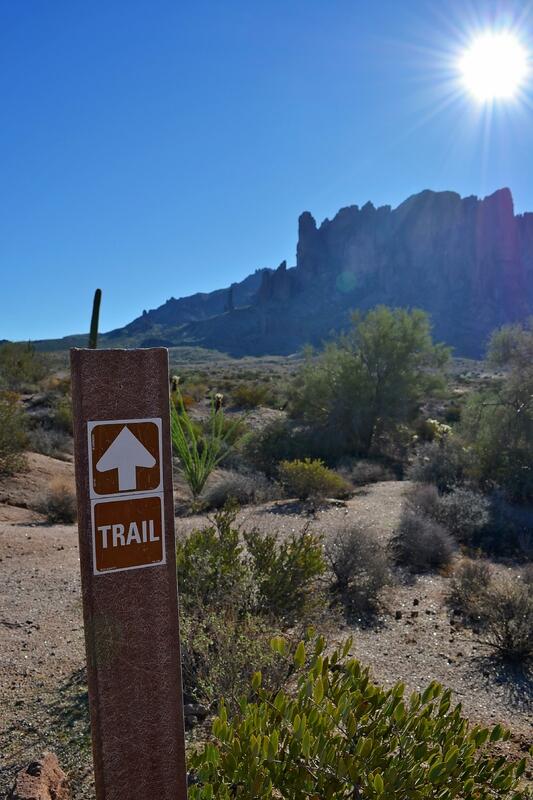 We won't really need it though; our trail runs straight into the shadow of the Superstition Mountains; an iconic Mesa-area landmark. 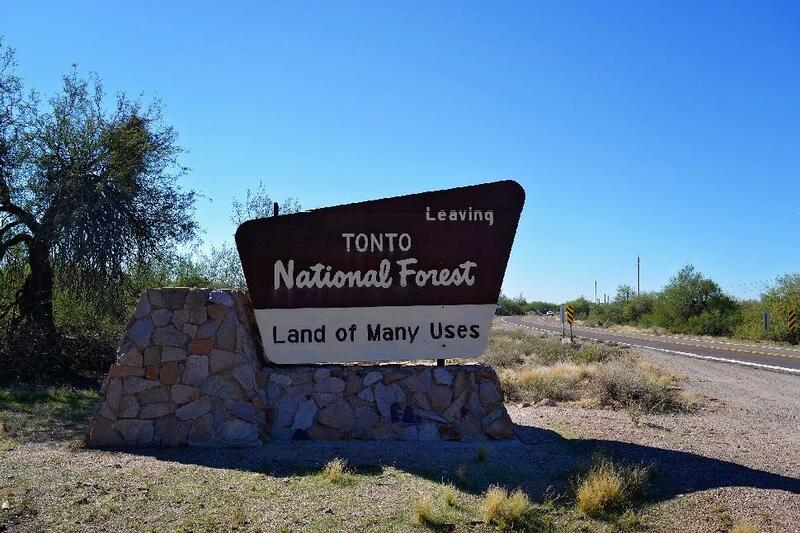 Everything in relative proximity evokes the American frontier to me, from the ghost town we passed on our way in, to the sign advertising we were driving along Apache Trail, a former stagecoach route. If the tall saguaro cacti that pepper the park could talk, they'd reveal all sorts of local lore. The elder ones are some 250 years old, nearly pre-dating the Wild West completely. 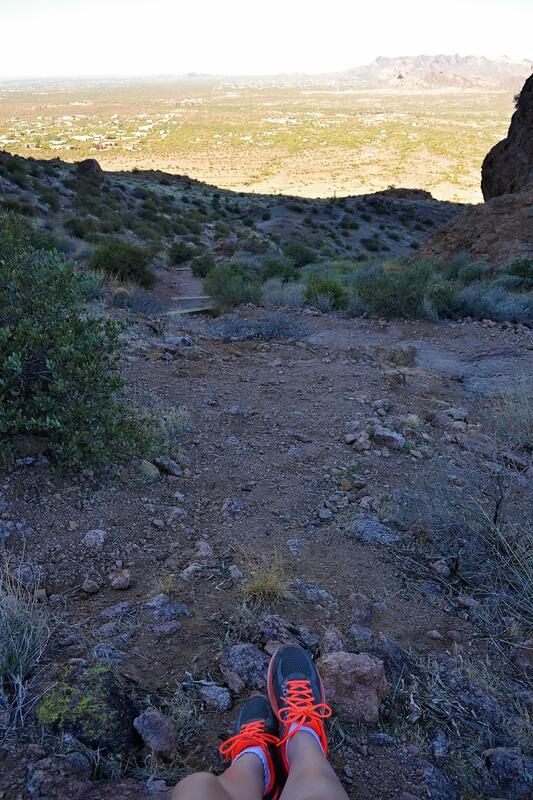 As we approach the Treasure Loop trailhead, I'm entirely engrossed in the state park's legend. 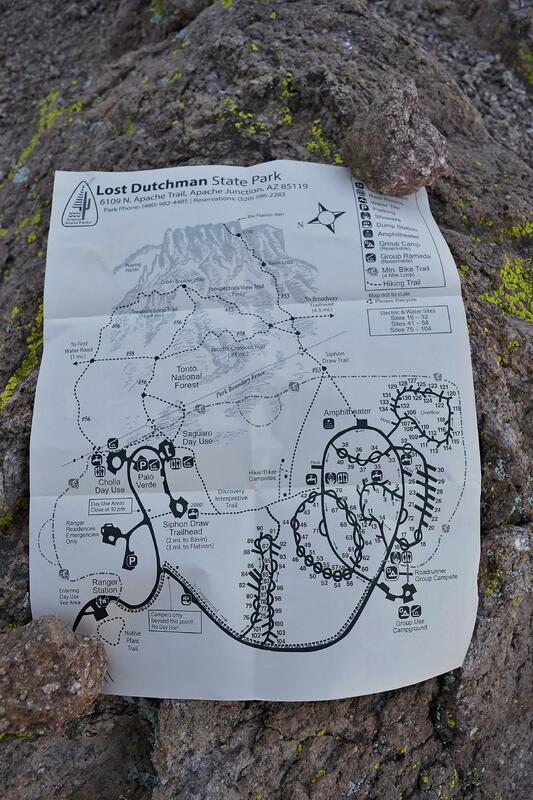 Who was the Lost Dutchman? I scan the park from north to south. It'd be pretty hard to get lost here. 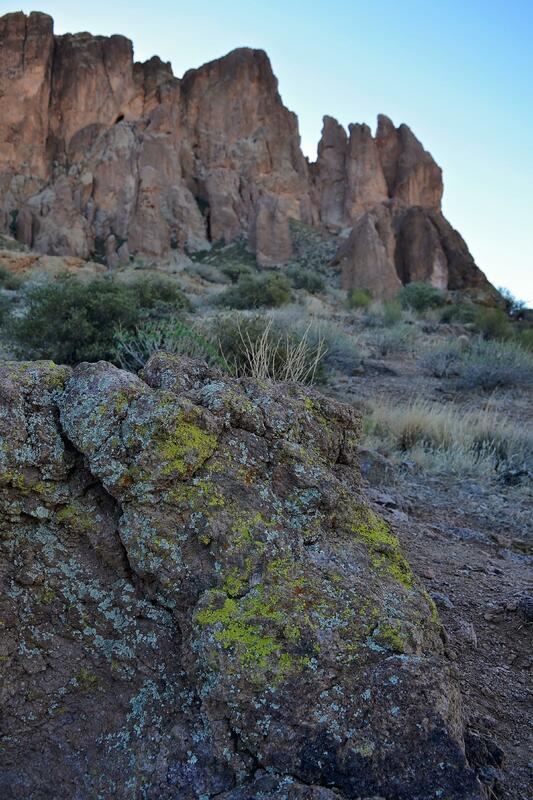 The desert flora of Tonto National Forest is low and sparse; the mountain peaks are distinctive, memorable. Multiple sources distill the Lost Dutchman tale back to Jacob Waltz. It wasn't Waltz who was lost, so much as his (alleged) fortune: a hidden 'mother lode' mine. He is said to have revealed its location to a neighbour while laying on his deathbed. Fact or fable? Who cares? The story is better left unwritten. For most park visitors the narrative is pure novelty, yet the legend is real for those who still seek out Waltz's treasure. And very real for those who have perished in their pursuit. Today, our pursuit, is simple. 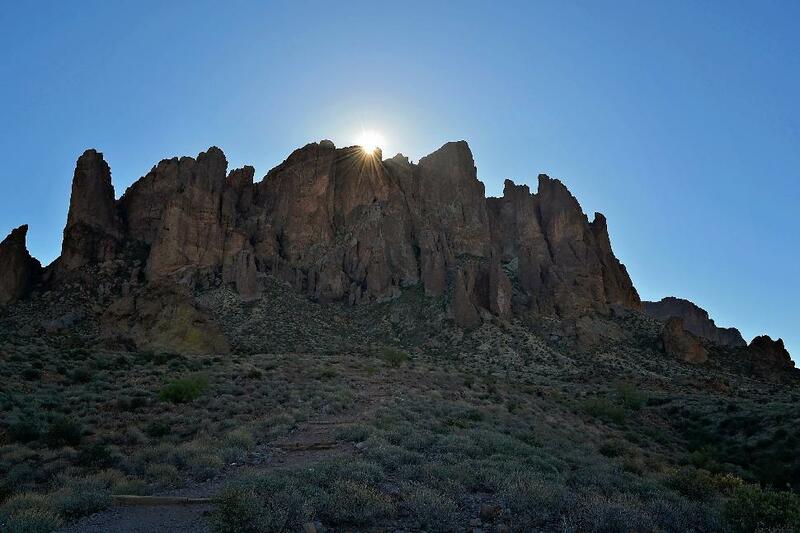 We just want to stand in awe beneath Superstition Mountain, which is Lost Dutchman's real treasure; a crowning jewel 'hidden' in plain sight. 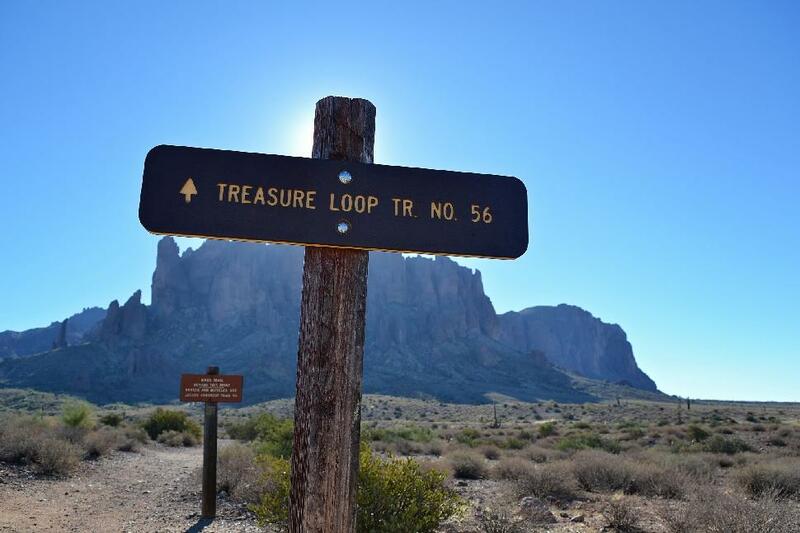 Where the Treasure Loop Trail intersects with Prospector's View Trail - the furthest we can ascend the Superstition slope - we opt to take it. We skirt southwest before descending and cutting north on Jacob's Crosscut Trail, which eventually deposits us back to Saguaro Day Use Area. Along the way we inspect a prickly buckhorn cholla and the sun-baked skeleton of a dead saguaro. A network of short, intersecting trails in any other forest might give hikers some anxiety. 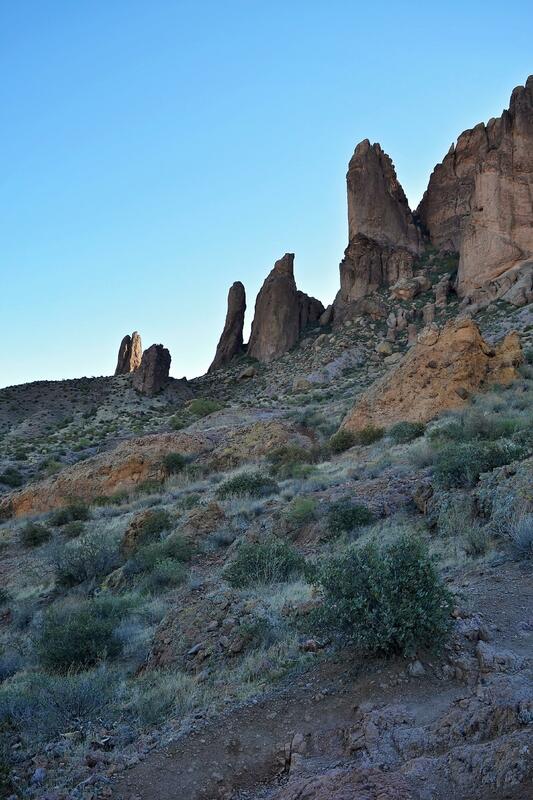 However, the front country trails that lace Lost Dutchman often offer up a view of the visitor center, which affords a sense of ease. Go, roam, let your feet lead the way while you muse on cowboy culture. 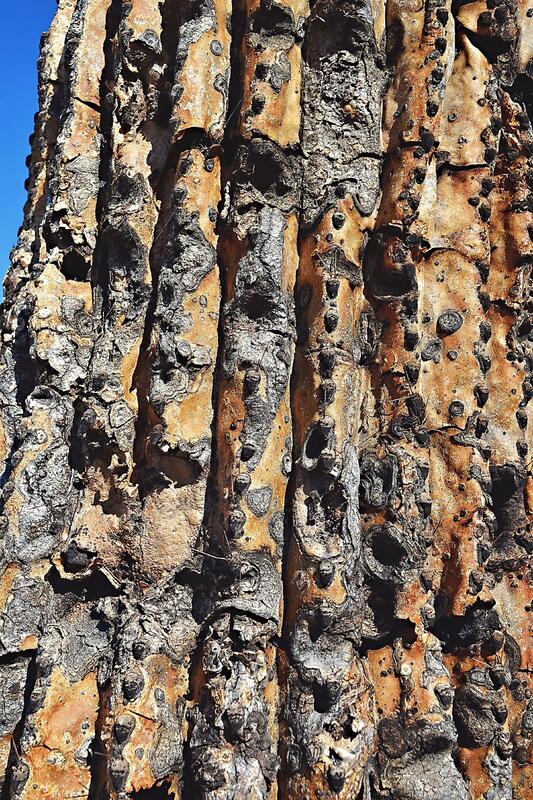 The 'wood' of a dead saguaro cactus. 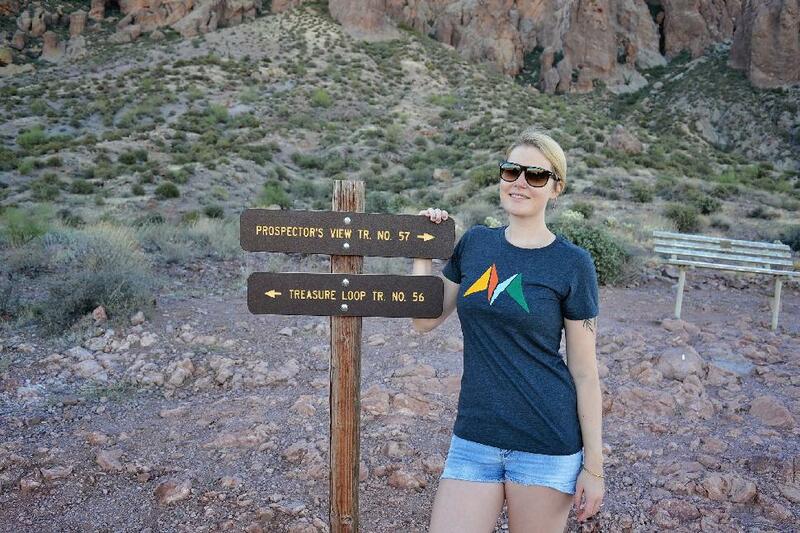 Where is Lost Dutchman State Park? 30 minutes east of downtown Mesa. 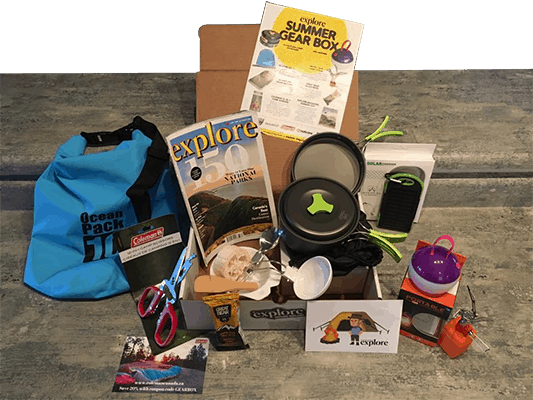 Easy-Medium: Treasure Loop Trail, 2.4 miles round-trip. (3.8 km). 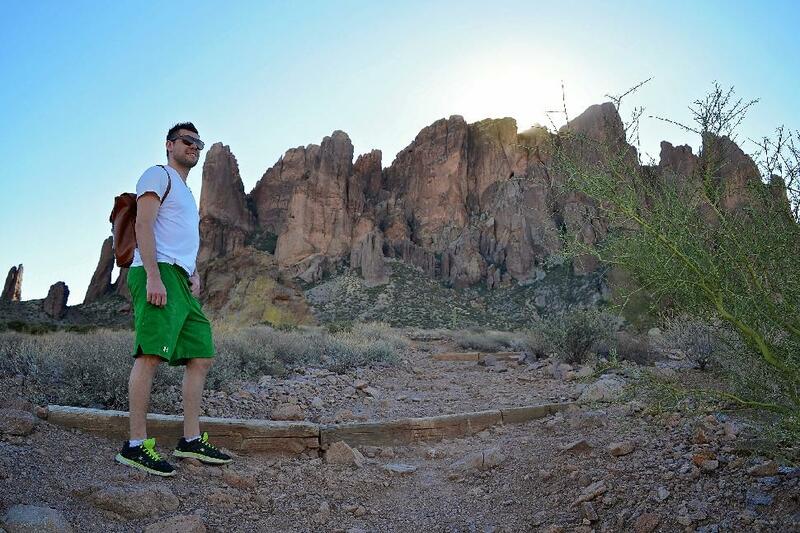 A pleasant wander with nice views of the surrounding area and an up-close encounter with the Superstitions. Not a great challenge for those who are physically fit. Hard: Siphon Draw Trail, a 4-mile (6.4 km) out-and-back trail with some scrambling involved. This route offers hikers a proper workout. 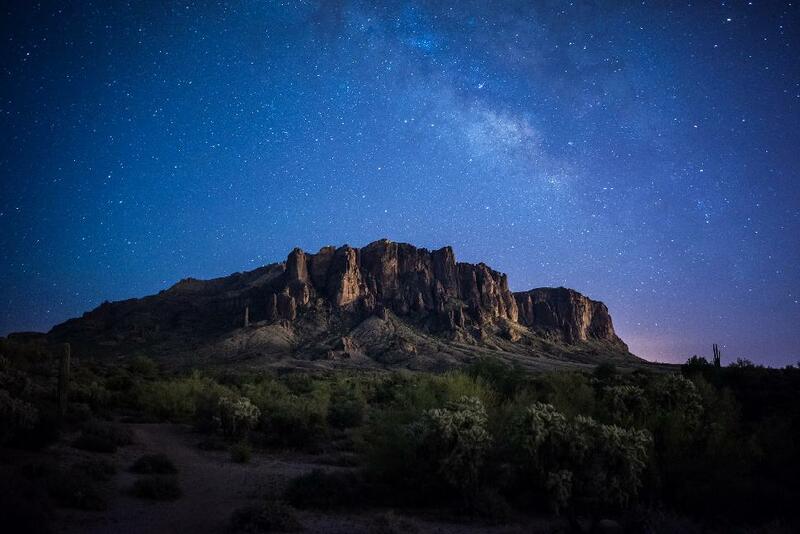 Want to experience the desert after dark? 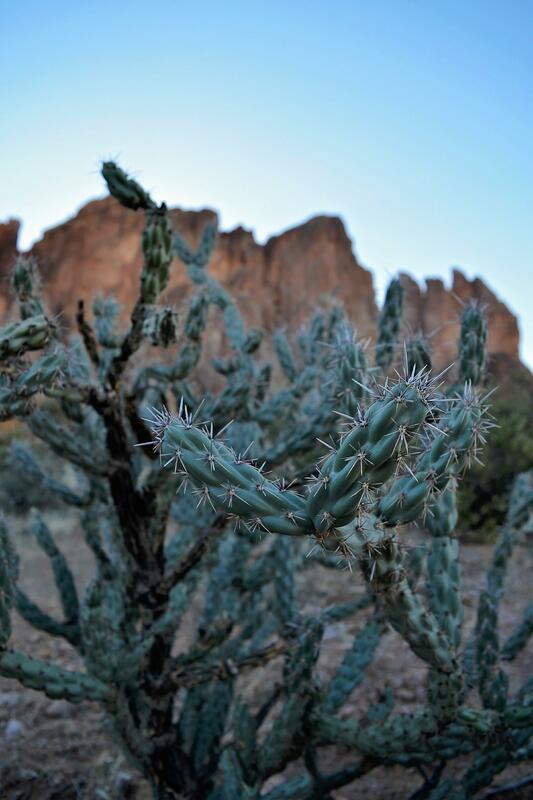 Lost Dutchman hosts park programming, including guided full moon hikes and star talks. Check here for upcoming events. 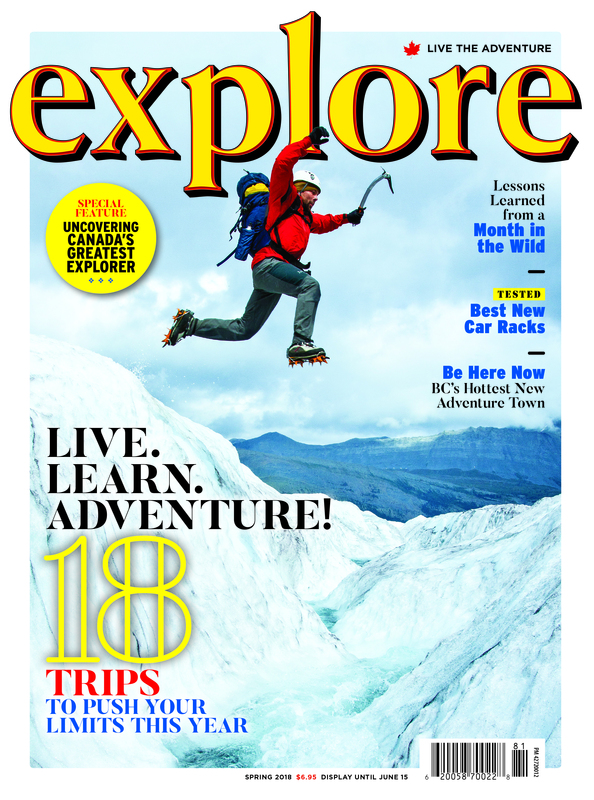 Where should you après-hike? 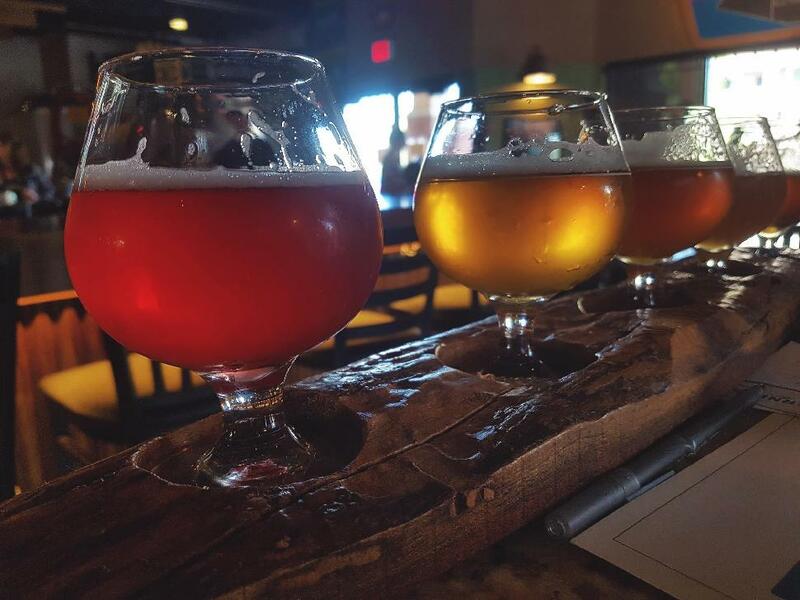 Whet your whistle at Arizona Wilderness Brewing Co. (The flights are huge!) We enjoyed playful brews imbued with prickly pear cactus and lavender. Refuel at Postino Wine Cafe in downtown Gilbert, which serves up tasty plates made with farm-fresh vegetables and ingredients from local makers. What else is there to do in Mesa? Go stand-up paddle boarding on Saguaro Lake, take in a Chicago Cubs or Oakland A's spring training baseball game, explore the Sonoran Desert by Tomcar, or admire the exhibits (free) at Mesa Arts Center. How do I get to Mesa from Canada? Starting inJanuary, NewLeaf and Wesjet will fly direct between Alberta and Mesa. Both carriers offer flights between Edmonton and Mesa that will run once weekly, and Calgary to Mesa three times weekly. WestJet's YEG departure and both of NewLeaf's itineraries will run until late April. Both carriers boast rates as low as $99 each way. 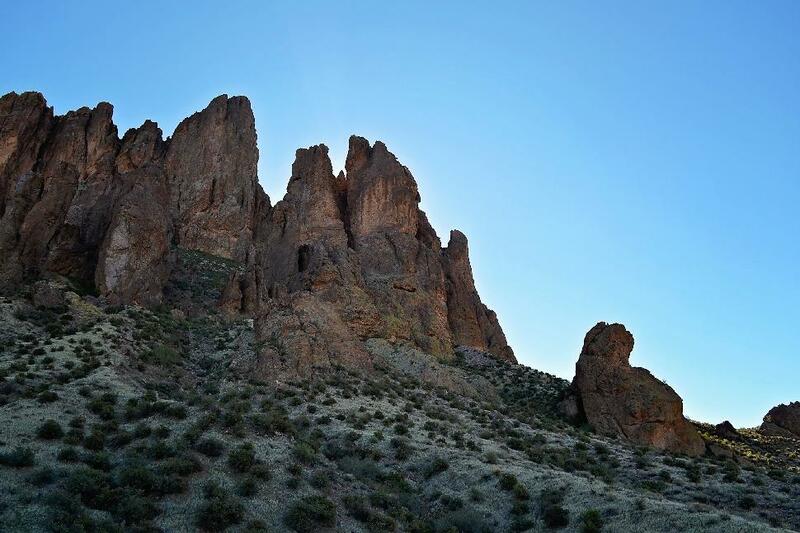 Have you hiked the Superstions?